These itineraries are thought to let you know the multiple aspects of hiking not only in the Dolomites and mountain trails, but also through easy Via Ferratas (iron ways), funny equipped paths and adrenaline passages so that you can touch with your own hands the thousand-year-old rocks. Enjoy local products, produced with deep passion and care for tradition, but also for innovation and tips inspired by the international cusine. Come with us in this breathtaking tour in the heart of the Dolomites! After arriving in Cortina and meeting your mountain guide, you will be provided with information about the itinerary and an assessment of weather conditions. In the afternoon you will be accomodated to Dibona refuge hut, which is at the foot of the majestic mountain Tofana di Rozes. This is the starting point to many Via Ferratas (iron ways) and climbing trails to the Tofana’s group of mountains. The refuge hut gives you also the gourmet experience with his great cusine, rich in homemade and traditional foods. Dinner at the refuge hut. Departure after breakfast at 08:30 a.m. from Dibona Refuge Hut. In the morning we will be going by Sote Cordes and Col dei Bos, to reach Lagazuoi refuge hut at lunch. Here Guido and Alma will welcome you with their delicious dishes and will make you feel like home even at 2700 m of altitude. The wonderful meal on the refuge hut terrace will make you forget about the efforts of the morning. After lunch we will keep going down along the Kaiserjager trail, past Falzarego pass, to reach La Baita refuge hut for dinner. This is a very nice and cozy hotel which was recently completely restored. 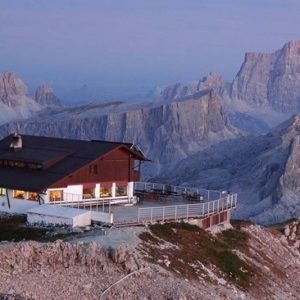 After an early morning breakfast, at 08:30 a.m. we will be taking trail n. 441 from La Baita refuge hut to reach the top of mount Nuvolau, where we will be taking a break for a delicious traditional lunch surrounded by the wonderful view of the Dolomites. After lunch we will be hiking the Via Ferrata named “Gusella” and by 4:00 p.m. we will be reaching Giau moutain pass. From here you will be transfered back to Cortina. 21st June, 5th and 19th July, 6th September 2019. Booking deadline: one week before chosen departure date.